This home has the most perfect location. 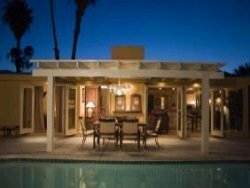 Just 2 blocks South (up the hill) from Wallys and The River, it is a perfectly located Rancho Mirage Cove home and it is modern, light, bright and cheerful, and has stunning, stunning mountain views from each room. Offering the relaxed feel of a beach house with lots of white and shabby chic, this home also has a sweet double glass door library entrance with a selection of books and a quiet reading nook with Music throughout. This great cottage home is located three minutes walk from the River in Rancho Mirage. This really lovely home has charm, yet is modern and elegant. The gourmet kitchen is open and bright with all new Maytag stainless appliances with coffee maker, electric tea kettle, toaster , microwave, double oven, dishwasher, large pantry and more. The extra large dining table is square and has seating for 12. There is an indoor full size Maytag washer and dryer. All the beds have luxury 600 thread count bedding with European duvets. All rooms have TVs and DVDs. Soon there will be a 100 inch theater screen also (coming soon)! This home features hardwood floors and beamed ceilings, and has many French doors and windows. It is light and bright from every angle. When you wake in the morning you really do think the mountains are in the room with you. The pool is really huge and perfect for laps and water games, and there is a therapy spa to relax in after a day of golf or shopping. You can enjoy the spectacular mountain views form every angle! There are lots of trees and flowers, and many areas to relax and sunbathe. Located on a large corner and just a short walk to the River (no car needed). 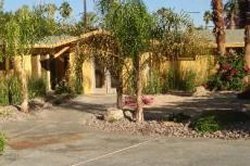 This home has a perfect location for your shopping and dining and relaxing Desert vacation! Make your booking today! 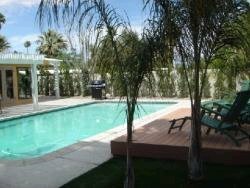 This Rancho Mirage River adjacent home is perfect for your Desert visit and close to everything!